April is Earth month and more specifically, Earth Day, on April 22nd. I always make an effort to be as eco-friendly as possible, yet I know there’s still room for improvement. One of the perks of working online and reading lots of blogs is that I learn about things I can do to change to a more environmental way of life. WaterSavers, a consumer awareness campaign from the International Carwash Association® (ICA) really opened my eyes about the way I use water. I never really even gave much thought about water before. I mean I use it for drinking, bathing, cleaning, etc like everyone else, but I’m now more aware of simple ways I can change HOW I use water in my home to live a more eco-friendly life. 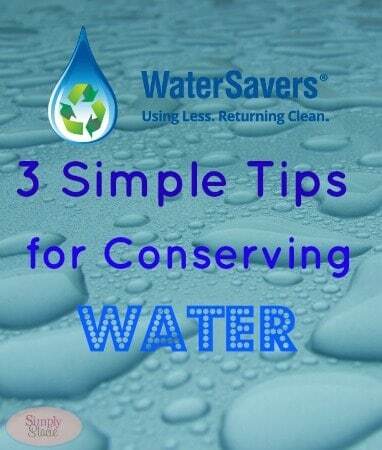 WaterSavers has come up with three easy ways you can conserve water in your home. The first tip was very eye-opening to me! 1. How to Be Green and Clean Your Driving Machine – Keeping your car clean with regular washing is an important part of responsible maintenance, but washing at home with a garden hose can use more than 60 gallons of water in as little as five minutes. Furthermore, you’re putting harmful chemicals and detergents down storm sewers and that ends up polluting our rivers and streams. You may be surprised to learn there is a greener way to keep your car sparkling: a professional car wash. A common misconception is that professional car washes waste water, when in fact the opposite is true. WaterSavers professional car washes, for example, use an average of no more than 40 gallons of fresh water per vehicle – less than the average home washing machine, which uses 41 gallons per load, according to the EPA. Professional car washes also responsibly dispose of — and in many cases recycle and re-use — the water runoff. 2. 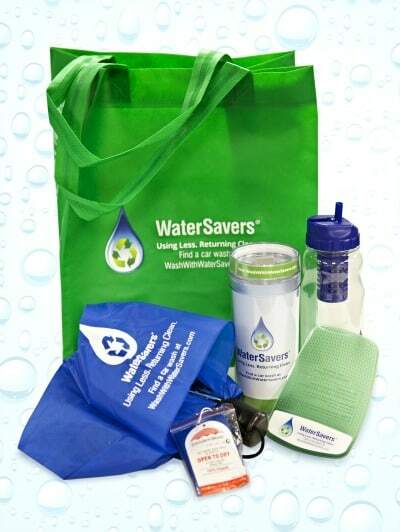 Go Green and Keep Your Whites White – It’s easy to take steps to conserve H2O and keep your wardrobe fresh. First, only run the clothes washer when you have a full load. Make this habit for both your clothes washer and dishwasher, and you can save up to 1,000 gallons of water a month, according to Wateruseitwisely.com. 3. Break Bad Bathroom Habits – Bathrooms are water hogs, accounting for about 75 percent of a home’s water usage. Adopting a green mindset in the bathroom can save major water and money. Start by switching to a low-flow showerhead, which National Geographic says saves 15 gallons of water during a 10-minute shower. Keep the occasional bath for a special treat because the average tub takes about 70 gallons to fill, so showers are much more efficient. After reading these tips, I will definitely be thinking twice before washing the car in the driveway. I actually prefer going to the carwash anyways. As for tip #2, I only wash in cold water and always wait till I have a full load before running the machine. The dishwasher needs hot water, but I still wait till it’s full before turning it on. We already a use a water saving showerhead and keep our showers short to save on the hot water. Our hot water is heated with oil so it’s crazy expensive. Two out of three isn’t bad right? At least now I know not to wash my car in the driveway. What are some things that you do to conserve water? Are there any ways you can improve? I am working with the International Carwash Association to share these tips for conserving water. However, my opinions are entirely my own. I collect rain water for my plants, turn off water while brushing my teeth, and try to do fuller loads of laundry instead of wasting energy on a half load. I collect rainwater for my flowers and veggie garden. I don’t use the sprinkler system more than once a week. Take shorter showers and do not leave the water on while brushing teeth. We try to use reclaimed water to work inthe yard… we also take shorter showers and turn the sink off while brushing our teeth! I like to think slacking on the car washing counts too… LOL.